Donald Trump Junior Visit To India: The plan for Trump Tower buyers to meet with US president Donald Trump's son is raising accusations of influence-peddling. Donald Trump Junior, 40, is the executive vice president of the Trump Organization. The president's eldest son, Donald Trump Jr., is making what's been dubbed an unofficial visit to India to promote his family's real estate projects. But he's also planning to deliver a foreign policy speech on Indo-Pacific relations at an event with Indian Prime Minister Narendra Modi. Beginning Tuesday, the junior Trump will have a full schedule of meet-and-greets with investors and business leaders throughout India where the Trump family has real estate projects - Mumbai, the New Delhi suburb of Gurgaon and the eastern city of Kolkata. Indian newspapers have been running full-page, glossy advertisements hyping his arrival and the latest Trump Tower project under the headline: "Trump is here - Are You Invited?" The ads also invited home buyers to plunk down a booking fee (about $38,000) to "join Mr. Donald Trump Jr. for a conversation and dinner." Public relations executives working with two local developers arranging the Trump dinner declined to give specifics about the event. During the visit, the 40-year-old Trump, the executive vice president of the Trump Organization, will take a break from his private promotional tour to give an address on "Reshaping Indo- Pacific Ties: The New Era of Cooperation" at a global business summit on Friday evening, co-sponsored by the Economic Times newspaper. PM Modi will also speak at the summit on the topic of "Preparing India for the Future." News that the Trump Organization would be offering buyers in the Trump Tower the chance to meet the president's son sparked criticism of potential conflict of interest, and the fact that Trump Jr. will be giving a foreign policy speech while on a private business trip complicates the matter further, ethics expert said. The senior Trump did not divest himself of his businesses when he was elected president. Rather, he turned the day-to-day operations over to his older sons, Don Jr. and Eric, to run. Eric Trump told The Washington Post last year that "the company and policy and government are completely separated. We have built an unbelievable wall in between the two." "Trump's company is literally selling access to the president's son overseas," said Jordan Libowitz, the communications director for Citizens for Responsibility and Ethics in Washington, which is frequently critical of the first family. "For many people wanting to impact American policy in the region, the cost of a condo is a small price to pay to lobby one of the people closest to the president, far away from watchful eyes." Critics have often complained of the high cost of Secret Service agents accompanying the Trump children on private business trips, straining the agency's budget. The Trump Organization's spokesman did not return calls or emails requesting comment. Amit Sharma, a spokesman for the Gurgaon developer, said that they had sold apartments worth nearly $70 million since the Gurgaon towers project launched in early January. The buildings, where flats run from $780,000 to $1.6 million, have private elevator service, in-residence catering and an indoor swimming pool. Trump Jr.'s tour of India, Sharma said, is a chance to "celebrate the entire exercise." Along with the Trump Tower Delhi NCR (National Capital Region) in Gurgaon, projects include two residential towers in the western city of Pune, towers in Mumbai and Kolkata and a planned office tower in Gurgaon, which is also known as Gurugram. The Trump Organization has more business entities in India than in any other foreign country, financial filings show, with licensing bringing in estimated payments of $1.6 million to $11 million since 2014. 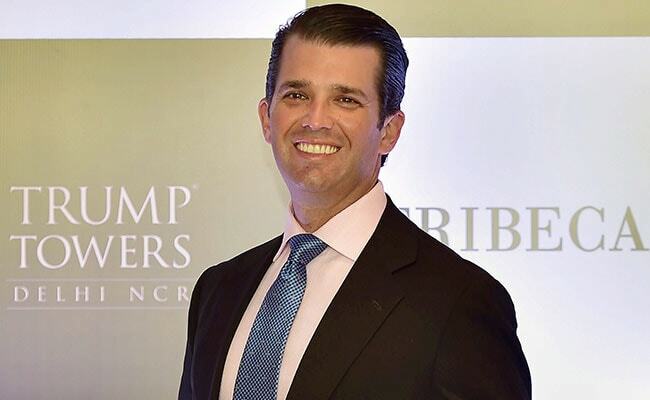 Later this week, Trump Jr. will travel to Mumbai to open the demo unit at the golden-facade Trump Tower that's being built by the family development firm of Mangal Prabhat Lodha, a state legislator in PM Modi's BJP. That relationship has also sparked concern about potential conflict of interest. As with most of its foreign deals, the Trump family licenses its name to the projects, collecting hefty royalty fees but avoiding risky investments. "Part of the deal was that Trump would come and do promotions every couple of years," said an employee of the Lodha Group, who spoke on the condition of anonymity because he is not authorized to speak to the media. The election changed that, he said, meaning the kids now have to step in. "Ideally we'd have preferred Ivanka," he said, referring to the president's eldest daughter, who is now an adviser to her father. "She has a better public image. But it makes sense for Donald Trump Junior to do it."